Well, we went to test things out … not great. I hooked three small bass. One was 10-to-11 inches. Julia caught one tilapia, and my wife got skunked. There were a few fish jumping here and there. We also saw a dead largemouth that was around 3-to-4 pounds. There are fish around, but they’re not feeding actively. If you were like many Angelinos, the whooping and hollerin’ erupted Halloween eve, as the area got three-quarters of an inch of rain. Didn’t seem like much, but after our dreadful drought, it was like gold falling from heaven. But for river fly fishers, the blow out was real today. Will and I walked four of our favorites spots, all around Atwater, and didn’t get a strike. If you follow this blog, you know that as recently as last week, 50-plus takes were reported. And I received an email over the weekend saying that Friday a guest contributor caught four largemouth bass. Aside from the dearth of fish remember that our river changes so much from rain, it’s pretty incredible. 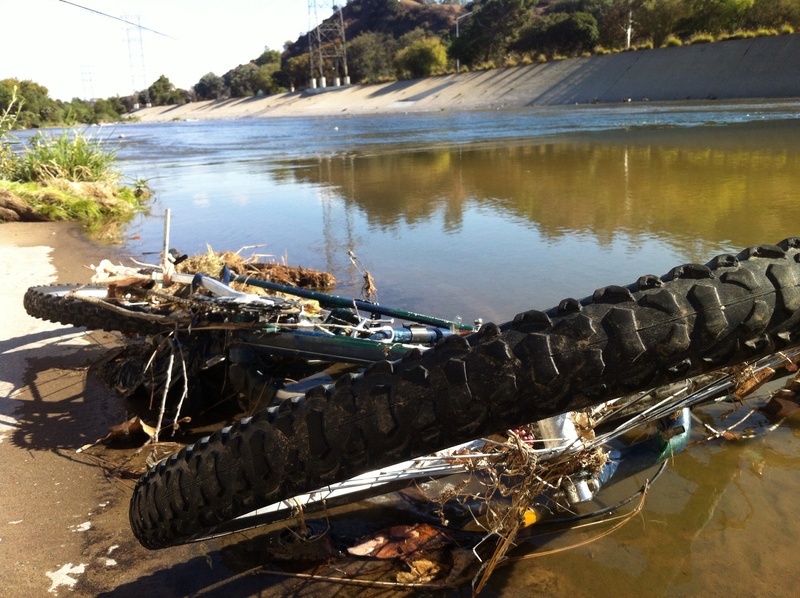 Where once there was a smooth eddy, now there is sand; where that sweet carp holding water was last week, this week just a wrecked tricycle appears in the water. Of course, the river and its creatures will return, but I do wonder about all the tilapia, bass, green sunfish — in other words, all the fun game fish we’ve been catching. Will they be able to withstand what most surely is coming, the rain of a mild El Nino? The carp can withstand just about anything. They come back for the spring spawn in large numbers, year after year. So, if you are a river planner, what does this pattern tell you? Pretty much, recreational fly fishers want safe havens for the fish so that their habitats aren’t ruined and they are still where fish stalkers expect them to be. And just as a reminder: stay out of the river when it rains. Don’t get caught in sudden water that could cost you a real lickin’ or worse. Weather and fate are tied together. Two winters ago, So. Cal. 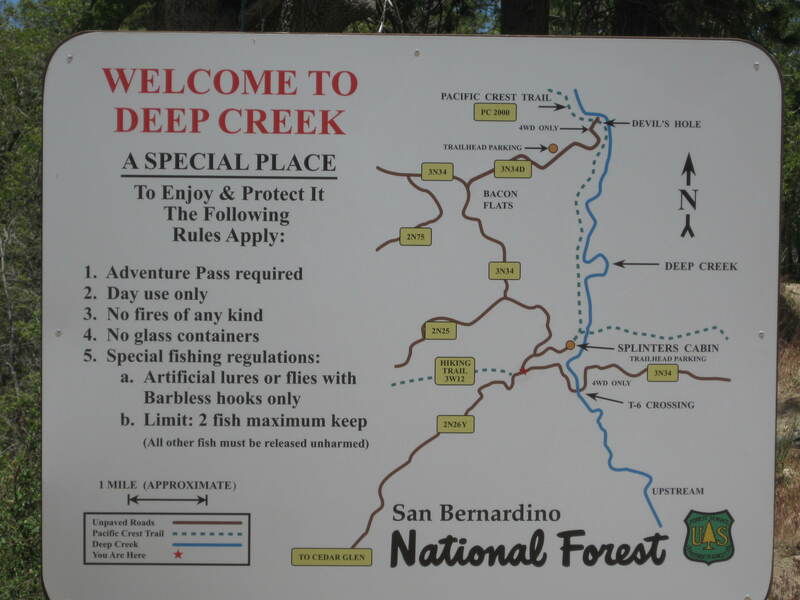 was literally awash in water, and so was Deep Creek, high in the mountains above San Bernardino. Those 18-plus inches helped to carry this once-cherry spot back to the near-top of many an anglers’ list. My last visit was May, 2011, which I chronicled here. So wondering what our sub par rainfall for the year just ended (6.97 inches, June 30) did to the place, yesterday I jammed the hour and a half from my house to Lake Arrowhead, thinking that “lucky Monday” would apply, even in summer. Any fly fisher can tell you that Mondays are the best time to avoid all those other folks, some with waders on, lots without, who want to hike, swim, bike, laze, and generally cavort on our public lands. But sometimes that Monday luck runs out. Sure enough, on a hot, windy gust the “whhhhiiiiinnnneeee” sound of a dirt bike engine greeted me, as I managed to find a parking spot among the dozen cars and one RV at the end of the road. It was just shy of noon as I rolled down the windows, ate a home-packed lunch, then — because I’m an optimist — inaugurated my new waders, even though the mercury was fast approaching 90 degrees F.
Thusly cocooned, I trudged past a nice grandfather and family, boots feeling way too big and clumsy for the heat. From his lawn chair in the shade, he looked me up and down, saying, “You think there’s enough water to catch a trout?” He quickly realized I was on my way in and didn’t have a clue. I grimaced, hoping he hadn’t just inadvertently given me one. After spending about four hours systematically working my way around the semi-circle of water that surround the Splinters Cabin, down to the beginning of the canyon, all I can say is, unfortunately, Deep Creek’s done for the season. The water is fishable, true, but the fish are few, small and not ready to believe your newly tied midge is anything but a bunch of wire and fixings. Also, true, that on the last hole I lost a nice fish because I forgot that a log has two sides, and I was on the wrong one. Equally true, I fished a 7-weight leader for the little guys, which he easily broke with the log’s help. For the rest of this long, hot summer, if you are more of an optimist than I, a party of three young guys who I think had just escaped from a scene in “Sucker Punch” told me that they’d spotted large fish much deeper in the canyon. I was done after losing the only good fish of the day, and didn’t follow their advice. Instead, I stripped off the waders and had a great time splashing my bathing-suit way back to the car, almost as free as a child until “whhhhiiiiinnnneeee” again reached my ears on hot, gusts, while I panted my way over the last hill. From dirt, to pock-marked asphalt, to the mountain-lip-hugging Highway 18, I couldn’t shake that eerie sound memory of straining machine, amplified by the wind. Then, suddenly, my fear realized, I saw plumes of smoke rising hundreds of feet from the distant San Bernardino valley. Scattered orange cones closed the 18. I stopped in front of a CHPS officer who told me how to thread my way onto the 138, to connect with the 15, then home. Tiny Arrowhead-adjacent Crestline was under a voluntary evacuation. Officials would later dub the brush fire, “the Panorama Fire,” which has burned 75 acres as I write and is still burning.